Gurin Thermo-Electric Dehumidifier employs Peltier technology which renders it quiet and light. This is a small dehumidifier which makes it perfect for use in small rooms, mid-sized rooms and is ideal for use in bathrooms as well. This eliminates the issues associated with humidity and dampness. This small room Gurin dehumidifier ideally fits on a workbench or desk. Water is stored in a spill-proof reservoir after extraction from air. This thermo-electric dehumidifier quietly removes moisture from the air. The unit shuts off automatically once the reservoir is full. This unit works on a quiet and light technology. 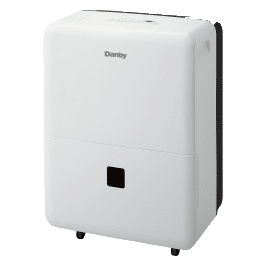 Read this Gurin DMD210V Thermo-Electric Dehumidifier review to know more about this compact dehumidifier. 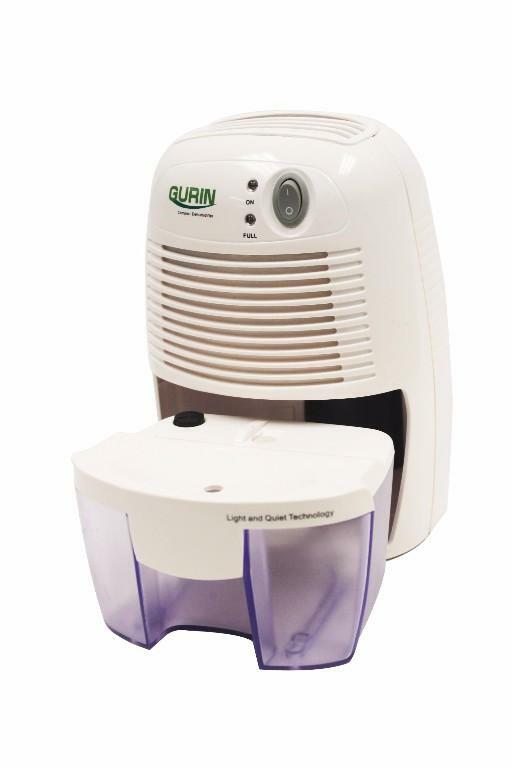 Gurin Thermo-Electric Dehumidifier DMD210V uses peltier technology to make it quint and light in weight. Size of this well deigned unit is perfect to use in a small or mid-size room, desk, boat, closet and R.V.s. 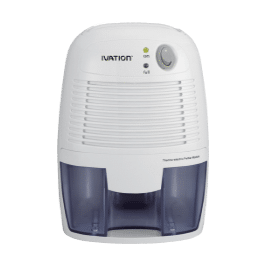 This compact small dehumidifier comes with a 16 oz spill-proof water tank. This unit also has an LED indicator to let you know when you should empty the water reservoir. 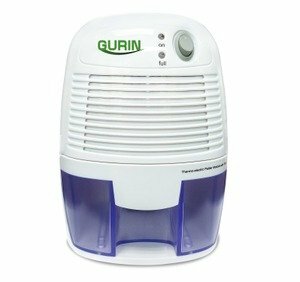 This Gurin Dehumidifier is a quiet and portable dehumidifier which is an ideal fit for use in small spaces. It is worth to consider this unit as it is light in weight and yet effective when it comes to operation. This unit weighs just three pounds. This makes it possible to move the unit whenever desired without putting much efforts. This unit is small in size and does not consume much space. This can also be used as a bathroom dehumidifier. The unit lacks a compressor and functions on Peltier technology for removal of moisture from air. The unit does not have any moving parts and hence the noise is eliminated while in operation. This may not be as powerful as models that are driven with compressors, however, it does offer a quiet operation. The unit is environmental friendly as it is extremely energy efficient. The Dehumidifier DMD210V works best for spaces that are of 110 square feet or less in size. 8 ounces of moisture are removed in every 24 hours. Bathrooms, basement, laundry units, small rooms and compact office spaces can benefit from this dehumidifier unit. This dehumidifier unit comes with a storage bucket that is spill-proof. It can hold 16 ounces of water. The unit consists of an LED light which illuminates once the bucket is full. The operations of the unit are shut until the reservoir has not been emptied. This thermo-electric dehumidifier is one of the most energy efficient dehumidifying units you can find in the market. This consumes little energy when it comes to operation. This makes this unit an environmental friendly unit. Plus, it saves on your electricity bills too. This Gurin dehumidifier has got a 16 oz spill-proof reservoir to store extracted moisture from the air. It can hold 16 ounces of water. The unit consists of an LED light which illuminates once the bucket is full. The operation of the unit remains off until the reservoir is empty. 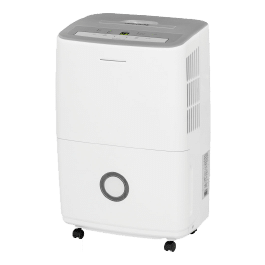 This Gurin DMD210V Thermo-Electric Dehumidifier review highlights all the features that this portable unit has to offer. The easy feature makes it one of the best dehumidifier for basement. This is one of the cheapest dehumidifier available in the market which offer efficient and easy operation. 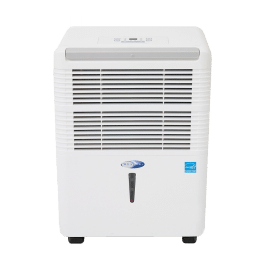 This Gurin DMD210V Thermo-Electric Dehumidifier is one of the most energy efficient Dehumidifier compared to other dehumidifiers in the market. This consumes little energy when it comes to operation. So, you shouldn’t worry about higher electricity bills due to Dehumidifier. Gurin products have been developed and manufactured for meeting the requirements of the customers. 100% satisfaction guarantee is offered on each product manufactured by Gurin. The product adheres to high standards irrespective of the retailer you make a purchase from. If the product fails to meet expectations, the user can request a refund or replacement. The customer service team can be contacted for further details. There is a provision to fill the warranty form on the official website of the manufacturer after making a purchase. Replacement can be requested to the manufacturer of this dehumidifier unit. The manufacturer assures 100% satisfaction to the users. However, if there is any issue, the customer service team can be contacting for initiating the replacement of the unit. 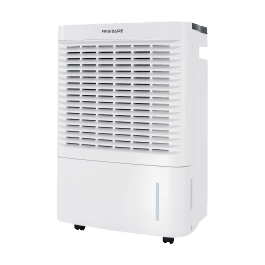 This Gurin dehumidifier deserves a decent rating from us when it comes to an economical, compact humidifier that would be ideal for small spaces. It is quite efficient when it comes to operation. This is evident from the dehumidifier reviews offered by the users for this unit. If we look at other dehumidifiers for sale, this unit is ideal for spaces of 110 square feet or less. This is a compact, portable unit which comes with attractive features. If you are looking for a quite unit to place in your bathroom, basement, laundry unit or a small room, then this unit is an ideal option. This unit works well in environments that are moderately humid. It fails when in environments that are highly humid. Excellent coverage is offered and impeccable energy efficiency is demonstrated by this unit which earns it high dehumidifier ratings from the users. If you are looking for a unit that does not cost much, yet accomplishes task in an energy efficient manner, then this would be your best bet. The step by step procedure for using this unit has been mentioned below. These simple steps can be followed for operating the unit without much hassle. A compact dehumidifier and a power adapter is offered with this unit. The user needs to plug in the adaptor in the socket. Turn on the power supply to the unit. A green LED light indicates that the unit has been turned on. This dehumidifier begins its operation and you must be able to feel the air coming out of the dry air outlet. The off button needs to be pressed for turning off the unit while not in operation. The water tank needs to be removed once the Yellow LED starts glowing for removing the water. The water tank needs to be removed only after you have turned off the unit. You can resume the operation once the water has been disposed and the tank has been put back into its place in the reservoir. Turn off the dehumidifier while cleaning the unit. Use a soft cloth for cleaning the product surface. The dust from the grills can be wiped utilizing a brush. Thank the author of this article is very detailed! Aww! Thats really sweet from you. Best of luck to you for accomplishing your mission. Nice to add a bit fun in your clock. Keep in touch. It must take a hell of dedications and efforts to do something really good. Yes of course it will be easy if you are confident enough to get the best out of you. Just be ambitious, work as you plan. Be unique and creative. Dont over think of whats gonna happen if you fail. Be specific in your own way. And “Never give up” . Best wishes buddy.